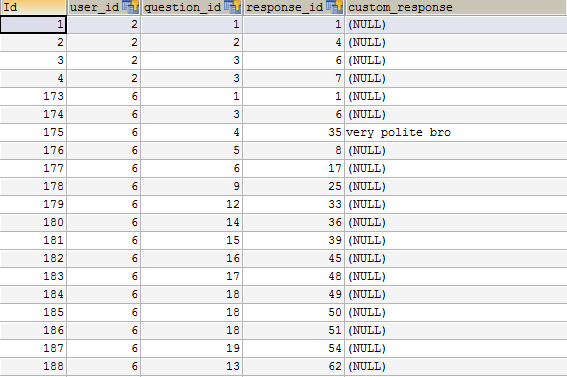 I need to select those distinct users from users_response(following) table who answered all questions mentioned above and have the same answer as mentioned under response_id (1,6,4,7) to the question_id(1,3,2,3) respectively. Result should be only '2'. Can you please help me or give me some hint to deal with it. Any dynamic way because count of question_id and response_id can be increased. like in this example here are only total 4 conditions are given but it could go up or down. but I'm getting no row while there is at least one row with user_id 2 is fulfilling conditions. There are many solutions for this kind of problem (it's called relational division). Not the answer you're looking for? Browse other questions tagged mysql join php or ask your own question. View references materialized for simple MySQL VIEWs?